The year is 2005: the Beijing authorities order the demolition of Suojia Village, a neighbourhood housing many artists critical of the government. Liu Bolin, who was born in 1973 and is just making his début as an artist, camouflages himself within the ruins of his studio and has himself photographed. The circulation of these photos gives rise to a silent and “transparent” protest that achieves an unexpected degree of popularity. Thus begins the remarkable career of one of the most talented and interesting contemporary artists, capable of concealing powerful social messages in apparently simple images, creating a synthesis of different artistic languages such as painting, installations, and photography. Liu Bolin's performances are designed to deliver a clear and compelling message concerning present events, at the crossroads between the weight of history and the consequences of progress. With time, Liu Bolin has himself photographed alongside the world's most important monuments, libraries, supermarket shelves, artworks, rubbish heaps, and immigrants. His fame grows until his images become an icon for major brands, starting from Moncler, which for several seasons uses one of Liu Bolin's camouflages for advertising purposes – not to forget Tod’s, Ferrari, and many other companies. The exhibition at the Vittoriano tells Liu Bolin's story, from his first performance in Beijing to his 2017 photographs at the Royal Palace of Caserta and the Coliseum, which were especially taken for the exhibition in Rome and are here displayed in a world première. Held under the patronage of the Regional Government of Lazio, the Office for the Promotion of Culture of the Municipality of Rome and Fondazione Italia Cina, the exhibition is produced and organized by Arthemisia in collaboration with Galleria Boxart, and is curated by Raffaele Gavarro. The exhibition is supported by Generali Italia as part of Valore Cultura, the programme through which this company is promoting outstanding artistic and cultural events with the aim of making them more accessible to the public at large while also promoting Italy. Generali Italia shares Arthemisia's eagerness to offer new opportunities in terms of accessibility and participation. The events planned by Generali Italia to introduce a broader and varied public to notable examples of art includes a day of free visits for all private citizens on 11 April. The event is recommended by Sky Arte HD. The catalogue is published by Arthemisia Books. Seven thematic cycles explore Liu Bolin's artistic philosophy: from his first works from the 2005 series Hiding in the City to the present day, through an imaginary journey between China – with its renowned buildings, myths, and social problems – and Italy. The exhibition unfolds from Liu Bolin's début to the Grand Tour he has made over the last ten years (from 2008 to the present). In this journey encapsulated by the title Hiding in Italy, the artist immerses himself in quintessentially Italian places: from Milan to Verona, from Venice to Rome and the Royal Palace of Caserta. The journey continues with the section Hiding in the Rest of the World, where the artist has his portrait taken in London, Paris, New York, New Delhi, and Bangalore. Along the various stages of this ongoing itinerary, Liu Bolin explores – in a neutral yet conscious manner – highly relevant social issues, such as the frenzy of consumerism, which emerges with Shelves, and the question of immigration, with Migrants. Nor should we forget the glamour of Fade in Italy or his Cooperations, images created for the advertising campaigns of leading Italian and French fashion brands, and illustrating how art is always closely intertwined with reality, in all of its complexity and contradictoriness. 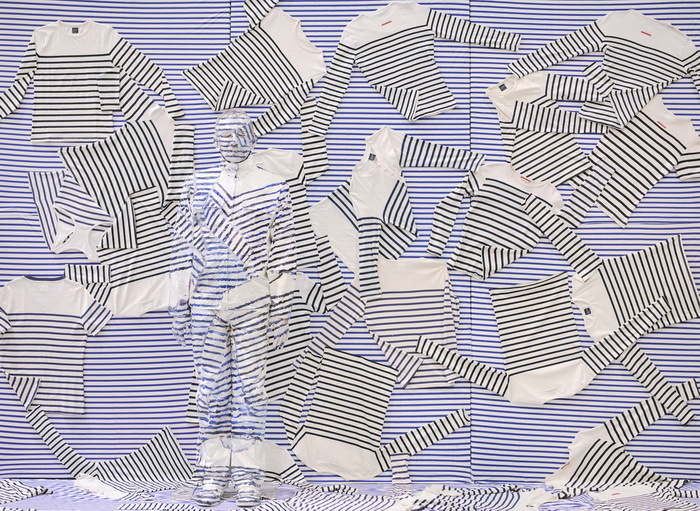 We find ourself at the very outset of Liu Bolin's artistic adventure. The year is 2005 and the Beijing authorities have ordered the demolition of Suojia Village, a neighbourhood located in the north of the city which house many artists' studios, including Liu Bolin's one. He is so taken aback by the event that he decides to find a way to artistically express his feelings. He therefore has himself portrayed as though he were part of those ruins, standing motionless in their midst. This marks the beginning of Liu Bolin's development of a very personal artistic language which combines performances, painting, installations, and photography. This first work already reveals the conceptual framework of the artist's research, which behind the apparent simplicity of camouflaging shows his intention to pursue a process of knowledge-acquisition involving the juxtaposition of his own identity and that of the “things” surrounding him. Liu Bolin embarks on a journey through the most representative places in Beijing and China: from Tienanmen Square and the Forbidden City to newly developed urban areas, with an eye to the contradictions that have emerged at the crossroads between past and present, between cultural identity and social issues. Liu Bolin's Italian Grand Tour leads him abroad for the first time and acquires the same value as this journey had for European artists in the past. Lieu Bolin encounters places, buildings and works stemming from a very different culture from his own, and which lend additional meaning to the process of knowledge-acquisition marked by his immersion and vanishing within them: from the Arena to the Scala della Ragione in Verona; from the Duomo and La Scala theatre to the contemporary Palazzo Lombardia in Milan; from the Rialto Bridge to St Mark's Square in Venice; from the Villa of the Mysteries to the Temple of Apollo in Pompeii; from Ponte Sant’Angelo to the Pauline Bonaparte as Venus Victrix of the Galleria Borghese and the Coliseum in Rome; to conclude with the grand spaces of the Royal Palace of Caserta. Once again, Liu Bolin here combines famous landmarks with lesser-known sites, juxtaposing them with his own identity in search of a form of continuity, a common matrix that belongs to matter – to “things” – and yet is at the same time cultural. His Grand Tour further highlights the fact that Liu Bolin's artistic pursuit is not just a process of aesthetic definition, but an illustration of how the differences between peoples and cultures can be overcome through the desire and the quest for knowledge. It only seems natural for the voyage begun in Italy to continue around the world. Liu Bolin starts from the identity embodied by the national flags of China and the United States, and the trans- national one of Europe – the world's three main political and economic realities. He then juxtaposes his own identity to that resulting from the colourful sum of all the flags of the world, significantly entitled The Future. The artist reaches London and Paris via Alres. He lands in New York and reaches New Delhi via Bangalore, the capital of the southern Indian state of Karnataka, the technological hub of India, where he merges with a garbage disposal station (Bangalore Garbage Disposal Station, 2014). Liu Bolin's works illustrate an experience of the world, a journey to discover different places and their distinctive features, as well as the events which have shaped them, as is especially the case with Ground Zero in New York. “Fading” in Italy, becoming part of it: amid food, wine, culture, design, and the legendary Ferrari brand. Liu Bolin plays with obvious clichés, but also with the essence of a land and people of which he becomes part. In this way the artist endeavours to show the extent to which the process of globalization is a consolidated legacy of our age. The “invisible” artist allows himself to be seduced by all of this, charming the viewer. Yet his artistic philosophy also marks a limit: the fact of standing at the centre of his representation and of the photographic lens portraying it. 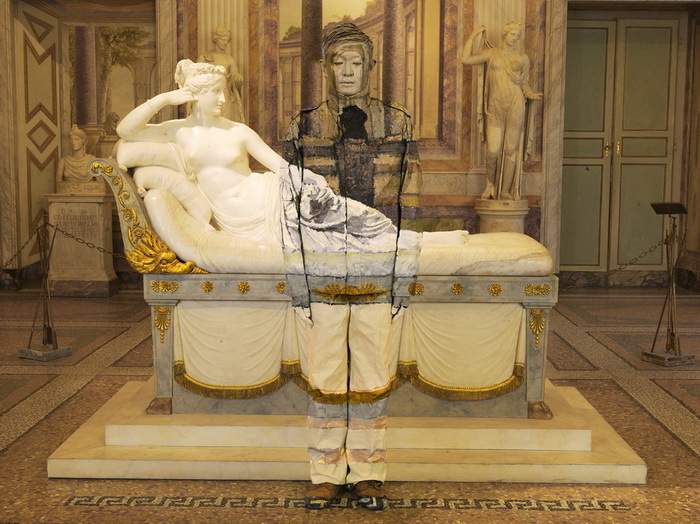 Like many leading contemporary artists, Liu Bolin has chosen and agreed to become part of a popular and sophisticated sphere such as that of fashion. He has put his artistic language and mode of representation to the service of some of the world's top brands. From Valentino to Lanvin, from Jean Paul Gaultier to Angela Missoni, the artist has become the protagonist of major advertising campaigns, including a world-famous one by Moncler. On the one hand, this is no doubt a testament to the popularity attained by Liu Bolin, which extends beyond the narrow confines of contemporary art; on the other – and most significantly – it reflects the artist's desire not to shun any of the manifestations of contemporary reality. It confirms the fact that an artwork is an integral part of its age and of the world, as this manifests itself in all of its contradictions. The Shelves series, starting from Supermarket n°1 of 2009, illustrates Liu Bolin's eagerness not to overlook – in his quest to know the world – the phenomenon of consumerism, which distinguishes contemporary culture and society. The author's identifying with the neatly arranged products filling the shelves of stores and supermarkets is something we all experience in our everyday lives. Nor does this phenomenon overlook cultural products, as is shown by the shelves filled with magazines and newspapers. The intended message is: we are what we consume, and what we consume consumes us, eroding our innermost and most private identity, making us all the same via similarity and the global spread of the same products. Yet this is only an illusion, since in reality the juxtaposition of our own identity and that of these products creates an artificial oversimplification of the concept of equality: a form of sensory deception that Liu Bolin reveals through the blatant visual deception that constitutes the cornerstone of his work. Migrants represents the other side of the coin and of the world, where heavily laden shelves, powerful cars and refined clothing and textiles are not so much possible desires, as the marker of an unbridgeable distance, a deep rift running through our age, difficult to express through images. The fact that Liu Bolin identifies with both, as one thing among other things which in turn are very different from one another, further confirms just to what extent his art strives to become a significant part of reality in all of its complexity.